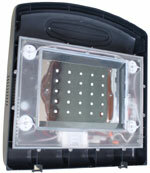 HOOD ONLY 89 WATT - PROFESSIONAL This will fit both 24-28 gallon tanks. 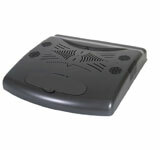 Great for freshwater and saltwater tanks. This hood has been discontiuned and if ordered will automatically be upgraded to the new WIFI MODEL. Our high intensity LED illumination system delivers the power of halides and the broad coverage of T5 lighting with over 10x the lifespan. It requires less energy consumption, is cool running and offers beautiful shimmering light while being eco-friendly. LEDs do not produce any ultra-violet radiation that is harmful for living organisms and do not contain any toxic mercury that is harmful for the environment. These solid state components are extremely durable and prevent accidental lamp breakage through handling associated with fluorescents. Consuming less energy puts less greenhouse gas emissions into our surroundings…. Our 89 watt LED system provides comparable PAR output to our 150 watt HQI – 14K canopy system, while consuming approximately 40% less energy.. Enjoy the mesmerizing shimmering of all 3 light cycles generally only found in nature. Aquarium lighting for the 28 and 24 gallon nano cube. The secret to our cool running top is our artistic canopy which houses an efficient aluminum heat sink for fast heat dissipation. All canopies are made from Flame Retardent ABS Plastic. 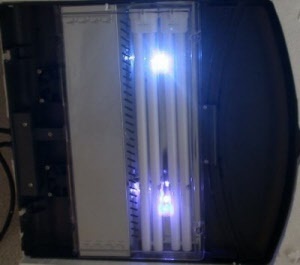 The 4 cooling fans automatically turn on/off with the main lighting system. 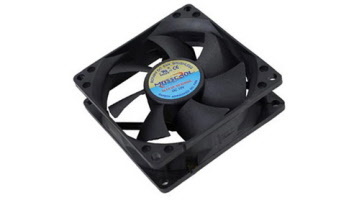 A thermal protector is also added to automatically shut of the lighting system in the event the fans fail, it will automatically turn back on once temperatures reach safe conditions. Spectrum of Jbj Led Lights.